Crossbar & Accessories are a great way to expand your display space and options. Our crossbars come in either 30 or 36 inches long, then attach our waterfalls onto the crossbars to hang your merchandise. 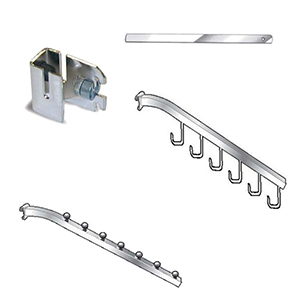 The Crossbar Bracket connectors with Lock Nut attach to Universal System Standards and can be used with crossbars. Be sure to check if you need left, right or center for some items. Slatwall and Gridwall have their own brackets to hold crossbars. Get all your Crossbar & Accessories essentials at American Retail Supply, call now to get same day shipping for all in-stock items. 1-800-426-5708.